Posted by Dave Emory ⋅ December 12, 2013Post a comment Email This Post Print This Post Tweet This! COMMENT: In the aftermath of Nelson Mandela’s passing, it is important to remember the true nature of the forces he opposed and the fact that they did NOT disappear with the demise of Apartheid. In FTR #225, among other programs, we examined the Nazi heritage of the Broederbond, the primary power center of the Apartheid government of South Africa. In Miscellaneous Archive Show M8 (Part 1; Part 2), we noted the profound German role in aiding the South African effort to develop the atomic bomb. In FTR #’s 317 and 324, we examined Project Coast biological warfare program of the apartheid regime. Linked to elements of CIA and Dr. Larry Ford (possibly belonging to the milieu of the 2001 anthrax attacks), Project Coast involved the use of anthrax, as well as AIDS as weapons of biological warfare. 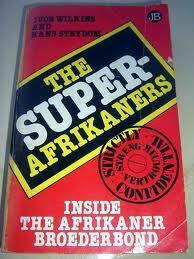 In both programs, we examined the post-Apartheid survival of the Broederbond as part of the Underground Reich. An incisive post by German-Foreign-Policy.com (which feeds along the bottom of the front page) supplements the programs cited above. The article notes the profound support given the Apartheid forces by the Third Reich and later, the “new” Federal Republic of Germany. The point being that the forces against which Mandela struggled were neither isolated nor trivial. They did NOT go away! EXCERPT: Federal German authorities provided the apartheid regime of South Africa incriminating documents for a political trial against Nelson Mandela and others. [Evidence suggests that the CIA did the same–D.E.] This has become known through research of Bonn’s South Africa policy. According to this information, West German authorities provided documents originating in the proceedings to ban the KPD to a South African diplomat and offered the support of Germany’s domestic intelligence service. This was to help prepare a trial aimed at neutralizing the political resistance to the racist regime in Pretoria. Nelson Mandela, who died last week, and is now being praised by Berlin, was also affected. On the one hand, Bonn’s objective was to help apartheid to remain in power, because it was considered a reliable pro-western partner, and on the other, to maintain special West German influence, which has also provided German companies lucrative business. In fact, German companies remained among the apartheid regime’s most loyal supporters – to the end. During Mandela’s incarceration, companies in West Germany supplied South Africa’s military and police with helicopters to carry out surveillance of protests. They were equipped with devices to identify activists, many of whom were from Mandela’s political entourage. German support for South Africa’s racists extends long before the beginning of the apartheid regime. It became particularly effective beginning in 1933. “German-South African relations” had “developed during the ‘Third Reich’ advantageously,” according to research of the German South Africa policy. Back then “under the protection of the South African Justice and Defense Minister Oswald Pirow, whose forefathers were German and who, himself, was a Hitler fan,” not only “the bilateral trade” flourished, but it triggered “a brisk exchange” with “Afrikaans students and professors.” “Afrikaans anti-Semites” attempted to “assess the applicability” of Nazi anti-Semitic laws “on South Africa’s Jewish population.” German South Africa “experts” had, for their part, considered “Premier Hertzog’s strict policy of racial segregation to be a genuine South African attempt to solve the race problem of the country.” Many agreed in circles of German trade to Africa. They were seeing “a surging colored flood tide rising ever higher” in South Africa. To “protect western culture,” the “close cooperation of the white peoples” was essential, according, for example, to the periodical of the Africa Association. Bonn continued its support of Pretoria on a working level – for example, during the trial of 156 members of the opposition for high treason in late 1956, which the Apartheid authorities used to weaken the growing resistance. Nelson Mandela was one of the defendants. According to the above mentioned study, “the prosecution sought Bonn’s assistance in this important trial,” and received it without delay. West German authorities passed on to the South African Chargé d’Affaires – with insufficient examination – “several documents (warrants, indictments and verdicts) of the proceedings to ban the KPD.” The West German Attorney General’s Office also indicated that the Federal Office of the Protection of the Constitution could meet the “South African request concerning documents about the KPD’s ‘front organizations’.” The author of the analysis suspects, these documents had been “asked for during a phase of the trial, where the prosecution was about to run out of arguments against the defendants.” In any case, the prosecution evidently was of the opinion that “the study of the KPD trial (…) also provided valuable insights,” the West German trial observer in Pretoria, Harald Bielfeld, reported to Bonn in October 1958. Bielfeld had already previously been active in South Africa – as a diplomat of the German Reich. Over the years, West Germany’s relations to South Africa have remained close – even while other countries had begun to take a distance to the Apartheid regime. For example, when more than 100 US enterprises withdrew from South Africa in mid 1987, German companies expanded their trade and investments. West Germany also approved export credit guarantees for German deliveries, as the publicist Birgit Morgenrath, co-author of a book on West German business relations with South Africa  recalled years ago. West German companies contributed also to “South Africa becoming a nuclear power,” wrote Morgenrath: These companies – particularly Siemens – are accused of having supplied South Africa with the separation nozzle process developed in West Germany for uranium enrichment for nuclear bombs.” And West German banks made extensive loans to the Apartheid regime. As Morgenrath wrote, the Federal Republic of Germany had finally become the “world’s most important direct financier of Apartheid.” . . . .
Nelson Mandela received training from Israel’s Mossad in the 1960s, an Israeli government document has revealed. The document, a letter sent from the Mossad to the Foreign Ministry in Jerusalem, said Mossad operatives also attempted to encourage Zionist sympathies in Mandela, Haaretz reported. Mandela led the struggle against apartheid in his country from the 1950s. He was arrested, tried and released a number of times before going underground in the early 1960s. In January 1962, he left South Africa and visited various African countries, including Ethiopia, Algeria, Egypt and Ghana. Mandela met with the Israelis in Ethiopia, where he arrived under the alias David Mobsari. The letter noted that Mandela “showed an interest in the methods of the Haganah and other Israeli underground movements” and that “he greeted our men with ‘Shalom,’ was familiar with the problems of Jewry and of Israel, and gave the impression of being an intellectual. The staff tried to make him into a Zionist,” the Mossad operative wrote. “In conversations with him, he expressed socialist worldviews and at times created the impression that he leaned toward communism,” the letter continued, noting that the man who called himself David Mobsari was indeed Mandela. This letter was discovered several years ago by David Fachler, 43, a resident of Alon Shvut, who was researching documents about South Africa for a master’s thesis.